braska. He came here during the early days of its settlement and has developed a fine ranch in section twenty, township fifteen, range five, and become closely identified with the best interests the community where he has passed so many years of his career. Mr. Lumadue was born in Pennsylvania, July 5, 1845, and was eldest of four boys and one girl, the family of Robert and Mary Ann Lumadue. Our subject's mother died when he was but eight years of age, and the family became scattered, the father moving to Illinois and remarrying, where John W., our subject, joined his father. On July 20, 1861, Mr. Lumadue enlisted in Company H, Twelfth Illinois Volunteer-Infantry, and saw four years' service, receiving his honorable discharge July 25, 1865, at Springfield, Illinois. Mr. Lumadue participated in the battles of Fort Henry and Fort Donaldson, receiving two wounds at the latter place, then at the battle of Shiloh and at the Siege of Corinth, and also at the second battle of Corinth, being wounded again quite severely; and was in the campaign of Atlanta, having re-enlisted; then at Snake Creek Gap and Lookout Mountain July 4 and July 22, and was present at the time General Pherson was killed; he was also in the battles of Bentonville, at Altoona Pass, and was with Sherman on the march to the sea, being on scout duty, and continuously in line of battle all along the march; he was at Savannah, Georgia, siege, then on the march to where Johnson surrendered at Rollo, North Carolina, then to Washington, D. C. Mr. Lumadue had four years' of service and was in many of the most notable battles of the war. He returned to Illinois after the war where he remained about three years. On August 2, 1867, Mr. Lumadue was united in marriage to Miss Mary Jane Covey, and to this union have been born nine children, six of whom are living: Annie, wife of John Beck, has eleven children and lives in Merrick county, Nebraska; Nettie, wife of Jacob Inbody, resides in Merrick county; Emma Trotty, now Mrs. George Barker, has five children and lives in York county, Nebraska; Charles, married, has four children and resides in Lincoln, Nebraska; Myrtie, wife of William Grant, has one child and resides in Merrick county; and Julia, wife of William Williams, who resides with her parents. On April 16, 1871, our subject came to Merrick county, Nebraska, and homesteaded in section twenty, township fifteen, range five, where he is still living. He has here a fine ranch and stock farm and also raises small grain, and breeds Poll Angus stock and Duroc swine. Mr. Lumadue is one of the few original homesteaders of Merrick county that still remains on his homestead farm, and is a pioneer settler who, has passed through all phases of early days. He is prosperous and successful, having a, modern improved farm well equipped. He owns in all one thousand three hundred and sixty acres of land in Merrick county, at one time having owned two thousand acres. Mr. Lumadue and family are widely and favorably known in social and educational circles. Mr. Lumadue is a self-made man, himself and wife having started out with but little of this world's goods. He has been closely identified with the growth and development of this portion of Nebraska, and is widely and favorably known. Charles D. Pangborn, a leading citizen of Creighton, Nebraska, is widely known as a gentleman of good business ability and true public spirit. He is now a retired business man, and cast his lot with Nebraska in 1882, reaching Creighton on the second day of June, when but two or three cabins constituted the town. He bought a relinquishment some four miles west and one mile north of town and proved up on it under the homestead rights. Here he lived until the spring of 1889, moving to town on the fifteenth of April, where he engaged in selling farm implements until the spring of 1892, and in the fall of that year opened a harness shop and salesroom, conducting this enterprise about four years when he retired from active business. Mr. Pangborn was born in Oswego county, New York, September 20, 1846. His mother died when he was but a few years old, and in 1854 he came west with an uncle, and made his home with another uncle near Blue Island in the vicinity of Chicago, until attaining his majority. When troops were needed in the war of the rebellion, Charles Pangborn enlisted - September 3, 1862 - in Company H, Eighty-eighth Illinois Volunteer Infantry, and served until June 8, 1865, when he was mustered out in Nashville, Tennessee, and discharged a month later at Chicago. His entire service was rendered in the Army of the Cumberland, participating in many small engagements and in the battles of Perryville, Stone River, Chickamauga, Lookout Mountain, Missionary Ridge, Whiteside Mountain, Kenesaw Mountain, and Siege of Atlanta. On Sherman's beginning his famous march to the sea, the Eighty-eighth, under Thomas, returned to Tennessee and fought the battles of Franklin and Nashville, and were in eastern Tennessee near Louden when news of Lee's surrender reached them, and were on a march between that point and Chattanooga, when they heard of Lincoln's assassination. After the war Mr. Pangborn followed farming in Cook county until migrating to Nebraska in 1882. Ilah, who is married to Edward Hoverson and lives in Missouli, Montana; Wilbert L., who is married and lives on his homestead near his brother, Albert L.
Mr. Pangborn is independent in politics, a member of the Ancient Order of United Workmen and of the Grand Army of the Republic. The fine, large residence occupied by Mr. Pangborn was erected by him in 1894, when waterworks were first installed in the town, and his house was one of the earliest to which pipes were laid. It has been kept in a perfect state of repair. During the first years on the ranch, times were hard and money scarce; like most of the early settlers, Mr. Pangborn burned hay, corn, and cornstalks until coal was more plentiful and cheaper. During the well remembered blizzard of January 12, 1888, fortunately, he was in the house; his pasture lay to the northwest, and his cattle drifting with the storm came into the sheds and none were lost; his twenty-two horses were all in the barn at the time. A severe hailstorm in July one year wrought havoc on the ranch, beating down all the grain and breaking over three dozen window lights. These losses could not well be born in those days, but there was no choice but to endure. For more than thirty years, the gentleman named above has been known to the citizens of this part of the state, and he has gained a high name as a citizen and a farmer. He is one of those substantial men whose integrity, industry, thrift and economy have added so much to the material wealth and prosperity of Nebraska. During his long residence in the state, he has not hesitated to take any measure which would promote the development of the community which he chose for his home. Mr. Hartmann was born in 1858, in Brandenburg, Germany, and is the son of Fred and Louise Hartmann. The subscriber's childhood and young manhood years were spent in his native land, where he obtained his education. When he was twenty years old, in 1878, the family decided to emigrate to America, where greater opportunities existed. They sailed from Bremen on the steamship "Brownsycke," and after an uneventful voyage arrived in Baltimore. They at once started for the "golden west," coming direct to Stanton county, Nebraska, where the father first rented a farm, and then when an opportunity offered, bought a farm which he improved in many ways. As for the subscriber himself, he bought the Lewis Lee quarter section, which has been his home ever since. During the first few years, the new settlers met with many discouragements, as for two seasons they lost all their crops by reason of the grasshoppers. However, prospects brightened up then, and now Mr. Hartmann is recognized as one of the most prosperous and successful farmers of this section. In 1882, Mr. Hartmann was united in marriage to Miss Augusta Swartz. They are the parents of fourteen children, all of whom are living. They are named as follows: Mary, Fred, Anna, Herman, Amelia, Bertha, Helen, Curt, William, Martha, Minnie, Walter, Frieda and Lewis. Among the prosperous citizens of Knox county, Nebraska, who have spent many years in this locality, is the subject of this review, John D. Brown, the owner of a valuable estate in Knox county, Nebraska. Mr. Brown resides on section twenty-three, township thirty-one, range six, and has lived in Knox county for many years. He has always taken an interest in the upbuilding and welfare of his county and state, and enjoys the respect and high esteem of all who know him, and his friends are many. Mr. Brown is a native of Ireland, and was born in New Market village in the year 1837, receiving his education in his native village, between times of helping his father on the farm. In 1889 Mr. Brown left his native land and started for the new world to make a fortune. He came to New York by way of Liverpool, embarking on the steamship "The Queen," and after arriving in New York, came direct to the state of Nebraska, to take advantage of the distribution of land by the government. He took up a homestead in section twenty-three, township thirtyone, range six, and later he bought the homestead of Albert Cladick, in section twenty-three, township thirty-one, range six, which is his present residence. He has steadily improved his farm until now he owns four hundred acres of the finest land in this section of the county. In 1866, Mr. Brown was united in marriage to Miss Margaret McSweeney. Mr. and Mrs. Brown are the parents of seven children, whose names are as follows: David, Mary, John, Peter, Ann, James and Martin. Mr. and Mrs. Brown and family are highly esteemed in their community, and enjoy the well wishes of a wide circle of friends and acquaintances. Mr. Brown is one of those substantial men who is a credit to the community in which he dwells, and has the sterling qualities that go to make an upright, reliable man. county, Ohio, February 13, 1853. A sketch of his father, to be found in this work, gives a full account of the family. Lycurgus (generally Kirk) Amos grew to manhood on the Ohio Farm, was educated in local schools, and as a young man engaged in farming. He was married in Carrol county, December 14, 1871, Isabelle Myers, also of Ohio birth, and daughter of Joseph and Luella (Hardin) Myers, the father of German descent and a native of Ohio, and the mother probably born in Virginia. Mr. and Mrs. Myers died in Ohio, where three of their daughters and three of their sons now live. In the fall of 1880 Mr. and Mrs. Amos came with their three children west as far as Fayette county, Iowa, carrying on farming there until the spring of 1883, when they came to Custer county. They secured a homestead of one hundred and sixty acres of land in section twenty-one, township eighteen, range eighteen, which is still the home place, and which has been improved and developed to a fine grain and stock farm. Seven children have been born to Mr. and Mrs. Amos: Merton S., of Custer county, is married and has six children; Cora I., died in 1877, at the age of two years; Otto O., is at home; John M., of Custer county, is married and has one child; Joseph Raymond, of Custer county, is married and has three children; Noel L. and Ted, at home. Mr. Amos is one of the very early settlers of Custer county, and one of the very few to retain possession of the original homestead for so long a period. He is prosperous and successful and is widely known as a man of high character and integrity, a substantial and useful citizen. He has the confidence and esteem of a large number of friends. John Welsh is a highly respected Irish-American citizen of Custer county, who has been a resident of the county for a period of more than thirty years, and during this time has witnessed the remarkable growth and development of central Nebraska from a pioneer region to that of well cultivated fields and comfortable farm houses. He and his wife are among the few to live continuously on their original homesteads, and have done their share to assist in promoting the cause of progress. Mr. Welsh was born in Ireland, March 4, 1837, the fifth child of James and Mary (Stephenson) Welsh, who were parents of eight sons and two daughters. He was reared and educated in his native land, and at the age of twenty years came to America, crossing from Londonderry to Liverpool, whence he sailed to New York in the spring of 1857. He made the trip alone, and lived successively in Jefferson and St. Lawrence counties, New York, until coming to Nebraska in March, 1880. Mr. Welsh was married in Jefferson county, New York, to Lavina S. Starling, their union taking place on December 29, 1868. She was born in St. Lawrence county, New York, a daughter of George F. and Mary Jane (Myers) Starling. After their marriage they lived on a farm in Jefferson county four years, and then moved to St. Lawrence county, where they resided until coming to Custer county, in 1878, with their two sons, George H. and Justin E. Mr. Welsh came in March, and the mother and children reached Kearney in June, when they drove the sixty-five miles between that point and the farm. 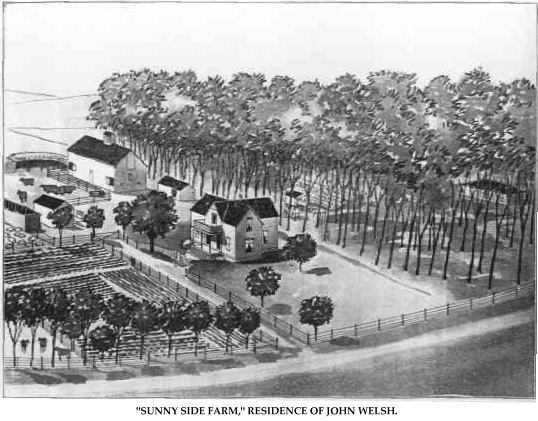 Mr. Welsh first took a pre-emption on some land, and in 1882 secured a homestead comprising the northeast quarter of section thirty-three, township seventeen, range eighteen, which has since been his residence and is known as Sunnyside Farm. One of the groves on his place is a favorite picnic place, especially for old settlers' meetings. We give a view of his comfortable home and surroundings, taken as when one of these annual picnic reunions is in session. Their residence the first year was a small "soddy" ten by fourteen, which was replaced by a larger one, which continued to be their residence until 1901, when their present ornamental dwelling was erected. Mr. Welsh fared much better in 1894, the dry year, than his neighbors, having raised nine hundred bushels of corn on a thirty-acre tract, besides having some potatoes and oats; few raised enough to seed their land the following year. Mr. Welsh was on the road from Ansley the day of the blizzard of January 12, 1888, and seeing the storm coming, returned to town, remaining over night. Mr. and Mrs. Welsh have three children; George H., a merchant, married and living in Westerville, has two children; Justin E., married and living two miles south of the home farm, has three children; Ena Pearl, wife of Fred Crawford, living on the old Crawford homestead. Mr. Welsh is a representative and public-spirited citizen, and he and his family have the respect and esteem of a large circle of friends. They own two hundred and forty acres of rich farm land in their home place, and a comfortable farm residence. They are among the honored pioneers who have done so much to build tip the region and have passed through the varied experiences of this class of citizens. Mr. Welsh is republican in politics, and has been a member of the Masonic fraternity since 1886, his membership now being at Ansley. With his wife, he is a member of the Methodist Episcopal church at Westerville; his door has, however, always been open to ministers of every denomination, some of them occasionally remaining weeks at a time, and only one of them ever abused his hospitality. "Sunny Side Farm," Residence of John Welsh. left their native land in their young manhood and came to America to carve out for themselves a name and fortune in the land of liberty and freedom, and who is highly esteemed by his fellow men as a good citizen and progressive farmer. Mr. Bauer was born May 24, 1857, in the village of Frank, Russia, a son of Johann and Katherina (Ulrich) Bauer. The father was born in Russia in 1825 and died there in 1905. The mother was born in 1827 and died in her native country, in 1890. Mr. Bauer learned shoemaking in his native country. In 1891 he emigrated to America, sailing from Hamburg to New York, the voyage occupying ten days. He reached Lincoln, Nebraska, on April 17, and soon after secured work at his trade. During the summer he found employment on farms. Mr. Bauer resided in or near Geneva, Fillmore county, Nebraska, for twelve years, and moved to Pierce county in 1906, where he now resides, his land being situated in section twenty-one, township twenty-five, range two. He owns one hundred and sixty acres of fine land, on which he remodeled the dwelling and built barns, granary, corn cribs and lesser buildings, making a good piece of farm property. February 1, 1880, Mr. Bauer was married to Miss Kate Wagner, a native or Russia, whose parents, Conrad and Barbara (Bauer) Wagner, became residents of Pierce county in 1891. To Mr. and Mrs. Bauer six children have been born: Mary, married Conrad Sell, of Council Bluffs, Iowa; John, married Barbara Lesser and farms near his father; George, Carl, Adam and Esther. Mr. Bauer and his family are members of the German Lutheran church, and Mr. Bauer votes the republican ticket. Mr. Bauer is a good neighbor and a worthy citizen. Should the reader of this volume ask for the name of a representative old citizen and settler of Howard county, a man who came in mature life to breast the storms of the wilderness and beyond the dreams of youth to hammer a home and fortune out of adversity, let him have that of the man who introduces this article. William Abel was born in Germany, August 6, 1832, and grew up there, spending his young manhood as a farmer., He came to America in the fall of 1859, alone, landing in New Orleans, Louisiana. He went first to Cincinnati, Ohio, remaining for a few months, then went to Franklin county, Indiana, making that vicinity his home for about twenty years. In 1880 he came into Howard county and homesteaded eighty acres in the St. Libory district, on section twelve, township thirteen, range nine. Later he purchased railroad land on section eleven, township thirteen, range nine, and owned at that time about four hundred acres, which he improved in good shape, having fine buildings and well equipped farm. He made that locality his home up to the spring of 1902, then sold his farm and settled, in St. Paul. In the following year he purchased two hundred and twenty acres in section twenty-six, and moved out on this place in the spring of 1903. He intends devoting this to stock raising, and has the place equipped with every improvement for conducting the business. Mr. Abel was married in Indiana, August 17, 1865, to Lizzie Swinkman, and to them were born two sons, one of whom died in infancy, while the other, William, junior, now occupies a part of our subject's original homestead in St. Libory district. He is married and has three children. Our subject's wife died in Howard county in 1882, leaving a large circle of sorrowing friends, for she was a most charming and estimable woman. Mr. Abel was married again at St. Libory, November 27, 1883, to Francis Karboskie, and they have a family of eight children, who are named as follows: Maggie, Joseph, Mary and Katie, all married and having comfortable homes in different sections of the country, while Annie, John, Frank and Francis are living at home. The entire Abel family is well known and highly esteemed throughout their county, and while Mr. Abel has never held office he has done much to promote the general welfare of his township and county. Prominent among the early pioneers of Nebraska is the gentleman who has been a resident of that state since 1870. Mr. Baillie is also one of the most prosperous farmers of the region, and is the proprietor of a fine ranch of about seven hundred and thirty acres of fine farming land, all in Sherman county. Alexander L. Baillie was born in Scotland, on March 5, 1842, and was the third in a family of seven children born to William and Jeanette (Lawson) Baillie. Of this family, five are living: Alexander and his brother, James, in Sherman county; one sister in Boston, Massachusetts, one in. Riverside, California, and another in Oregon. The father died in 1886, and the mother in 1900, both in Sherman county, Nebraska. When a very young man, Mr. Baillie learned the baker's trade and when only seventeen years of age, took the position of pastry cook on one of the vessels of the Cunard line, and he held this position for three years. He then joined his parents, who in the meantime had moved to Canada. son, Alexander, the subject of this sketch, also pre-empted one hundred and sixty acres joining his father's homestead in section twenty-eight, township sixteen, range fifteen. Through all the years since that time, this has been his home. In August of 1876, Mr. Baillie was married to Miss Effie Quinton, a native of Nebraska. She died in 1888, survived by her husband and two children, Lawson and Alfred. Later, in 1892, he was again married, to Miss Anna Anderson, who was born on Prince Edward's Isle. Mr. Baillie now owns one of the finest farms in the county, and he has put many valuable improvements on the place lately. In 1907 he built a beautiful new modern home, the old house having been struck by lightning and burned. Mr. Baillie has always manifested a commendable interest in local public affairs and has several times been called upon to serve his community in various ways. For nine years he was director of his school district number twenty-three, which his father was instrumental in organizing. He is regarded by all as a man of unusual ability and unquestioned integrity. Mr. and Mrs. Baillie have passed through many hardships and discouragements during their residence here in the pioneer years of the history of the state, and are now enjoying their well-earned ease. Fred Eyl, one of the old settlers of the region where be chose his home in the early days, occupies a good home and valuable property in section fourteen, township twenty-three, range three. He has done his share in the upbuilding of his locality, and is well and favorably known throughout this part of the state. Mr. Eyl is a native of Maryland, born October 1, 1854, a son of August and Augusta Eyl, both of Hanover province, Germany. The parents left Germany in 1854, embarking at Bremen on a sailboat and were six weeks on the sea, their destination being America, of which country they had heard such flattering reports. After landing in New York, they went direct to Maryland, where they remained until 1863; then with their family, they moved to the state of Indiana, living there three years, then going to Missouri, residing there for the same length of time. In 1869, when our subject was a young lad about seventeen, the family emigrated from Missouri to Nebraska, where they took up a homestead in section eleven, township twenty-three, range three, Madison county. They first put up a dugout on this land, and later a log house in which the family lived eight years, when this was replaced by a good frame house. In 1885 our subject was united in marriage to Miss Eliza Wyner, a native of Germany, and a daughter of Conrad and Elizabeth Wyner. Mr. and Mrs. Eyl had four children, whose names are as follows: Mary, Lizzie and Carl, and Fred, deceased. Mrs. Eyl died in 1898. In the early years of residence on the western frontier, many hardships and discouragements overtook the family, as they did all the sturdy sons who came to this locality and faced unknown dangers and privations. For the first four years they suffered greatly through the grasshopper pests that devastated this region at that time, destroying all those season's crops, leaving nothing but bare ground in their track where once were growing the hardy crops that meant so much to the early settler The family fought prairie fires many times to save their homes and possessions, and had to be ever on the alert, as, the fires would come so quickly that they rushed upon the settler before he was scarcely warned of their approach. As late as 1894 there was an entire loss of crops through the hot winds that prevailed on account of the severe drouth of that season, every vestige of green being burned almost to a black crisp. Deer and antelope were plentiful in pioneer days, and could often be seen in herds grazing in the open. Mr. Eyl was again united in marriage, July 18, 1899, the bride being Miss Anna Price, a native of Germany, and a daughter of Charles and Heneretta Price. Mr. and Mrs. Eyl have been blessed with five children, whose names are as follows: Harry, Nelda, Nora, Loretta and Loella. Mr. Eyl is a prosperous and successful citizen, and now owns seven hundred acres of choice land, on which are fifteen acres of fine orchard and forest trees. John O. Wilson, an early settler of Custer county, where he is one of the largest landholders, was born in Lucas county, Iowa, March 13, 1856. He is the fifth born of the twelve children of Joshua and Fanny (Templeman) Wilson, the father a native of Indiana and the mother of Ohio. The former died in Lucas county, Iowa, (where he had secured a homestead in an early day), in December, 1895, and the latter died in Custer county, Nebraska. One daughter, Mrs. Frank Smith, lives in Custer county; three sons and two daughters live at Alliance, Nebraska; two daughters and a son live in California; one son lives at Lost Beach, Washington; one daughter lives in Omaha, and John O., lives in Custer county. Nebraska, being survived by three children: William J., married and living in Broken Bow, has three children; Bertha L., wife of John McMahon, living on West Table, has eight children; John F., living nine miles west of Broken Bow, has three children. Throughout the years of his residence in Custer county Mr. Wilson has been actively identified with the best interests of the county and state and has done his share to advance their development and upbuilding. He has held various township offices and served several terms on the school board. Being an early settler, he passed through the early days of drouth and other trials of the pioneer there, and has won his present success by his ambition and determination to overcome all obstacles in the path of progress and prosperity. His home place of four hundred and eighty acres of splendidly improved land contains a fine modern residence which he erected in 1908, and he also has other suitable buildings. He owns some twelve hundred and eighty acres altogether, in Custer county, and is known as a good business manager. On March 10, 1904, Mr. Wilson was united in marriage with Mrs. Hannah Hircock, whose maiden name was Maxwell, a native of Iowa. She came to Nebraska in 1892, and by her first marriage had five children: Flora A., wife of John Kennedy, of Merna, has nine children; Charles W., is married and lives in Arizona; Fred J., living on West Table, has three children; William, living on West Table, has two children, and Dora Whitney, deceased. One of the first five families to settle at Plainview, Nebraska, was that of John C. Starr, who with Messrs. Dean and Rose migrated across country with oxen from Wisconsin to Pierce county, Nebraska, in the spring of 1871, reaching their destination and pitching camp for the last time June 20, after a journey lasting six weeks. Their claims were situated on the south side of Dry Creek, across from the locations of the Dealow brothers, who had preceded them by a week or ten days and were still living in their wagons. While camping near Norfolk they were referred to Mr. Chilons, then working in Pierce, who advised them to settle at Plainview, where he had recently filed on three quarter sections; the old surveyor, C. H. Fradey, located them on the land they selected. Knowing wood to be scarce they tied a bundle of small willows to the back of the wagons to serve as fuel until the men could go twenty miles to Bazile Creek for a load of wood. Mr. Starr's family lived in tents through the summer and in the fall he erected a sod house; he broke up a piece of the raw prairie the first season, the beginning of his farm home. But he was not to attain success until after severe trials that were to test his endurance to the limit. Year after year they saw a fair prospect of an abundant crop destroyed, sometimes in an hour, by the hordes of grasshoppers which settled down on their fields, darkening the sun. Starvation stared the early settlers in the face, and the grim wolf, want, drove many of them to abandon their holdings and move back east to begin anew where they had begun years before. But those who had the fortitude to remain have reaped a rich reward for their faith in Nebraska soil. During those early years, the energetic settler left wife and little ones to seek labor in a distant field that they might have a crust of bread. Mr. Starr for several years labored in the harvest fields around Norfolk, where all the crops had not been devoured, and after a turn at threshing, would return with fifty or sixty dollars in cash, together with a small supply of meat and flour to tide the family over until another crop would be raised. After proving up on his homestead claim, Mr. Starr moved to his tree claim in section live, one mile southwest of Plainview, where he built a frame house which now forms a part of the present family residence, the lumber for the original house being hauled from Yankton, fifty miles distant. Here in a grove of twelve acres, it is sheltered from the fierce winds that at times sweep the western plains. During their sod house days life was full of many strange experiences. One winter when snow drifted entirely over the house, a snow porch was constructed at one end of the house that, for months, served as a storage place for their provisions. The wash line was stretched above the roof on poles thrust down into the snow. A sudden wind storm one night carried the line with its contents across the field and they were not found until the snow melted in the spring. So rapid was the thaw with no channels for the water to run away that for six weeks the house was flooded to the depth of several inches, necessitating living on a platform built above the floor; when the water receded they lived for a week or so on a floor of sand spread over the dirt floor to absorb the moisture. Coffee was almost unknown for a year or two, a substitute being sometimes parched corn meal and sometimes roasted corn, the cob being steeped together with the parched grains. Twisted wisps of hay was their only fuel for a year, with corn and cornstalks for a change at other times; their only supply of wood in the canyons of the Verdigris and Bazile Creeks was cut off, as that region was settled and the land came into the hands of private owners. Provisions were at first purchased at Norfolk, thirty miles away, the trip requiring three days with their ox teams. On these trips their only food for the three days was "Johnny cake,"
which, in winter, they had to thaw out before it could be eaten. For three years the grasshoppers took everything they raised. An effort was made to have some early cabbage by tying cloth over them, but the pests ate their way through; the only thing to do was to cut and use it. Their corn was eaten down to the ground, and small trees were bent over by the weight of the grasshoppers when they would alight. Deer and antelope were plentiful and provided an abundance of fresh meat. At one time Mr. Starr, with the help of a hired boy, caught and killed a deer with dogs. The family witnessed three blizzards, those of 1871, 1880 and 1888. In the earliest of these, openings had to be shoveled out to the open air, the houses being snowed under; every prudent settler kept a large shovel in the house. And yet, after listening to these tales of awful hardships, one so often hears the expression, "Those were the happiest days of my life," such was the cheerful disposition of the pioneers. John C. Starr was born in the village of Upwells, Cambridgeshire, England, August 7, 1827. His parents, John and Sarah (Cawthorn) Starr, both died in their native land, having been engaged in farming all their lives. After marriage Mr. Starr continued at farm labor for two years before setting out for the new world, where he hoped to prosper as he had no opportunity of doing in the mother country. Sailing from Liverpool October 6, 1854, after a voyage of thirty days in an old sailing vessel they landed in New York, went up the river, and in time bought a tract of farming land comprising eighteen acres, fifteen miles from Saratoga. Here they lived for some ten or twelve years, expecting the summer of 1864, which he spent in Illinois, returning in the late fall to Saratoga county. In 1866 he moved to Buffalo county, Wisconsin, where he farmed five years and then moved to Nebraska, as recounted above. His first residence in the new country was a sod house, as was the usual thing in the early days, and this was his residence until moving to his timber claim some six years later. Mr. Starr was married at Outwell, Norfolk county, England, November 18, 1852, to Miss Agnes Townley, daughter of John and Hannah (Ruff) Townley, all of the county, where the parents spent their entire lives. Of the seven children born to Mr. and Mrs. Starr, three remain: Jennie, a teacher of note; Mary, married O. J. Frost, attorney-at-law, of Plainview; and Emma, who resides under the parental roof. Mr. Starr passed to his reward November 8, 1896, after a long and useful life. In polities he was a staunch democrat, and for a number of years served his community as justice of the peace. Willard L. Jenks, long and prominently known in Nance county, Nebraska, as a leading old settler of that locality, is now a resident of Sterling, Colorado. During his residence in Nance county he manifested true public spirit and gained the esteem of his associates by his honesty and integrity. In 1909 Mr. Jenks retired from active farm life, removing to Fullerton, where with his family he enjoyed all the comforts of a fine home and the acquaintance of most of the residents of that thriving little city. In March, 1910, he removed to Sterling, Colorado, where he now lives. Mr. Jenks is a son of Martin and Roena Jenks, and was born November 27, 1862, in Whiteside county, Illinois. He was reared on a farm, and on January 4, 1882, was married there to Sarah France, a native of the same state. They spent the first four years of their married life in Illinois, then came to Nebraska and engaged in farming, in 1893 Mr. Jenks purchasing one hundred and sixty acres on section twenty-two, township sixteen, range seven, which was their home place until February, 1909, when they settled in Fullerton. The family passed through the early Nebraska times in developing their home, and while at various times meeting discouragement and failure, were in the main successful, and built up a nice property. While in Nebraska Mr. Jenks took an active part in the affairs of his county and state. He held the office of road supervisor for a period of three years, and for nearly all the time of his residence there he wag director of school districts number eighteen and fifty. Mr. and Mrs. Jenks have a family of four children living, having lost an infant daughter. The eldest daughter, Lelah, married L. E. Coakley, and they with their son have moved to Sterling, Colorado; Elsie, who is a stenographer with a well-known firm in Omaha; Edna, married Jesse Jones and lives in Fullerton and Viola, the latter having the misfortune to lose her hearing in infancy through a childish ailment, and who for ten years was a student at the Omaha school for the deaf, is now in school at Colorado Springs, Colorado. Our subject was the second member in a family of seven children, three boys and four girls, two sisters now living in Illinois, two brothers deceased, one sister in Iowa, one sister in Alabama. Mr. Jenks' father died in June, 1910, the mother having died in 1905. Mrs. Jenks was one of a family of five, one sister died in March, 1881; and the balance of the family are living at the present time in Nance county.